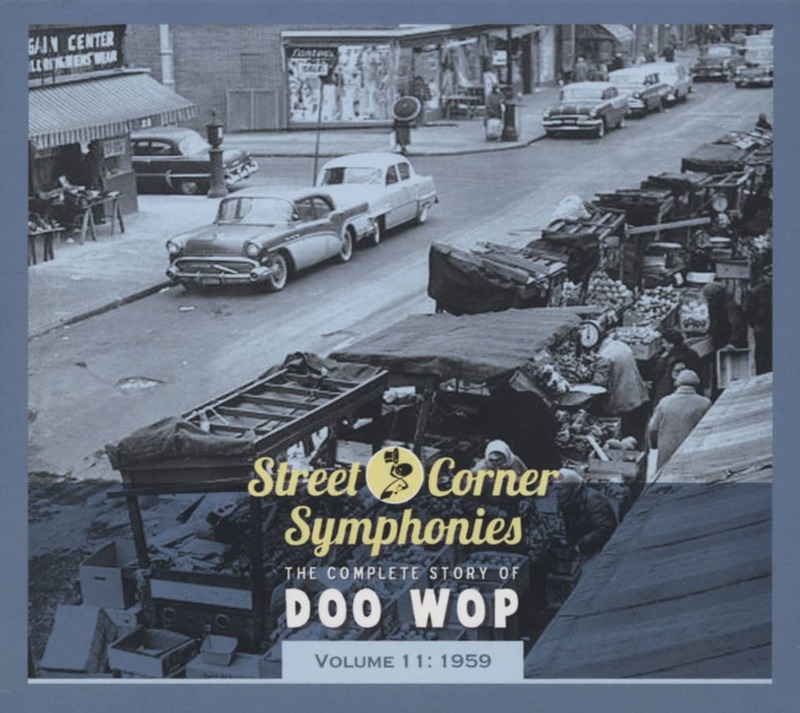 Dion DiMucci established himself as the king of doo-wop in the late 50s and early '60s. His sound exemplified the indigenous music of the 3ronx streets where he was raised. Dion made a name for himself both as a solo artist and as the leader of the vocal group The Belmonts (as well as the leader of the unheralded band The Del Satins). His unique voice and highly personal style can be heard to great effect performing a surprising array of musical genres - mainly doo wop. rock & roll and R&B. He also delivered quintessential teen-pop themes of romance. unrequited love and loneliness in a convincingly sensitive fashion. Much like Frankie Valli and The Four Seasons epitomized blue-collar New Jersey, Dion DiMucci personified New York in the pre-Beatles era. Bruce Springsteen claimed that Dion was the only artist who could fit into the Rat Pack and The 'E Street Band' with equal ease, while songwriter Jerry Leiber stated that he was 'the best white blues singer he had ever heard.' Dion's discography is incredibly varied. Throughout his extensive career he has moved from '50s pop, rock & roll and doo-wop styles into blues, '60s pop, folk and from there into the singer-songwriter movement, Christian music, and then back to pop and blues. 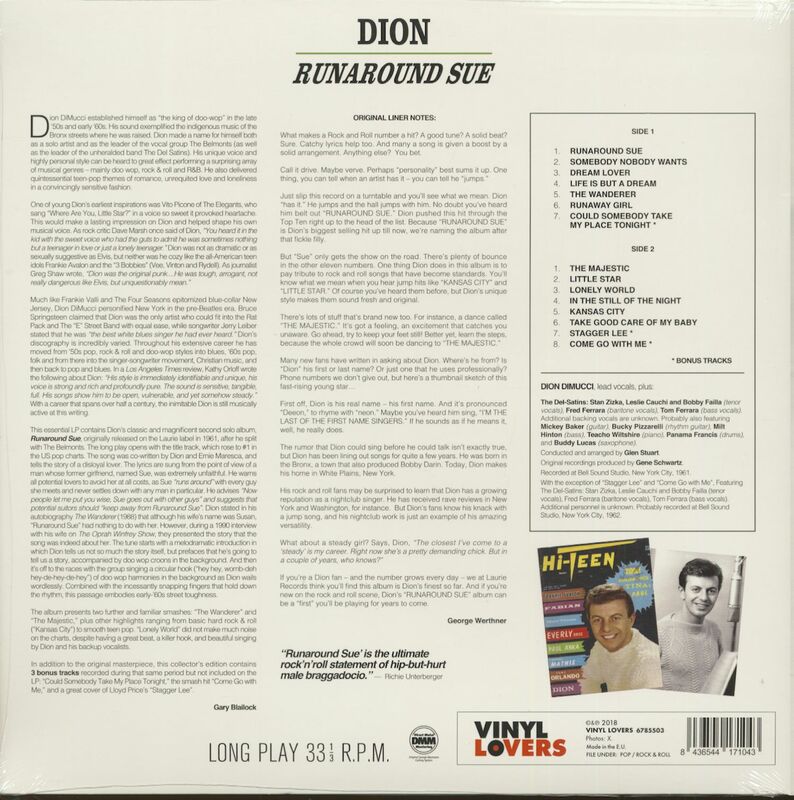 In a Los Angeles Times review, Kathy Orloff wrote the following about Dion: 'His style is immediately identifiable and unique, his voice is strong and rich and profoundly pure. The sound is sensitive, tangible,full. His songs show him to be open, vulnerable, and yet somehow steady.' With a career that spans over half a century, the inimitable Dion is still musically active at this writing. The essential LP contains Dion's classic and magnificent second solo album, Runaround Sue, originally released on the Laurie label in 1961, after he split with Tne Beirnonts. The long play opens with the title track. which rose to #1 in the US pop charts. The song was co-written by Dion and Emie Maresca, and tells the story of a disloyal lover. The lyrics are sung from the point of view of a man whose former girlfriend, named Sue, was extremely unfaithful. He wams all potential lovers to avoid her at all costs, as Sue 'runs around' with every guy she meets and never settles down with any man in particular. He advises 'Now people let me put you wise, Sue goes out with other guy' and suggests that potential suitors should 'keep away from Runaround Sue'. 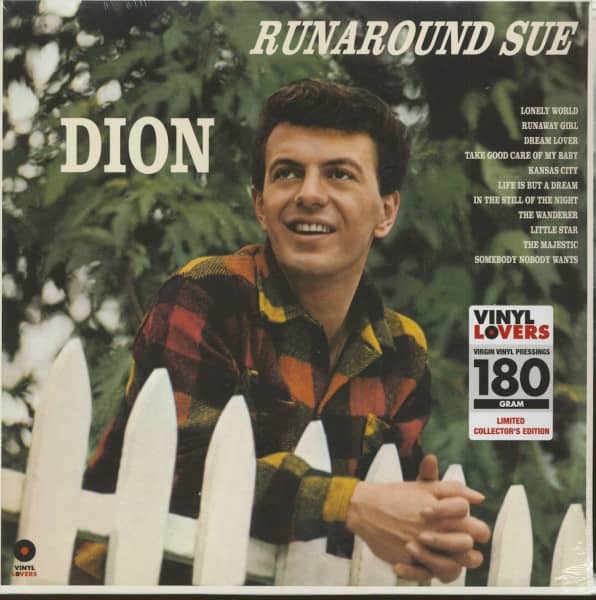 Dion stated in his autobiography The Wanderer (1988) that although his wife's name was Susan, 'Runaround Sue' had nothing to do with her. However, during a 1990 interview with his wife on The Oprah Winfrey Show, they presented the story that the song was indeed about her. The tune starts with a melodramatic introduction in which Dion tells us not so much the story itself, but prefaces that he's going to tell us a story, accompanied by doo wop croons in the background. And then it's off to the races with the group singing a circular hook ('hey hey, womb-deh hey-de-hey-de-hey') of doo wop harmonies in the background as Dion wails wordlessly. Combined with the incessantly snapping fingers that hold down the rhythm, this passage embodies early-'60s street toughness. The album presents two further and familiar smashes: 'The Wanderer' and 'The Majestic', plus other highlights ranging from basic hard rock & roll ('Kansas City') to smooth teen pop. 'Lonely World' did not make much noise on the charts, despite having a great beat, a killer hook, and beautiful singing by Dion and his backup vocalists. In addition to the original masterpiece, this collector's edition contains 3 bonus tracks recorded during that same period but not included on the LP: 'Could Somebody Take My Place Tonight', the smash hit 'Come Go with Me', and a great cover of Lloyd Price's 'Stagger Lee'. Customer evaluation for "Runaround Sue (LP, 180g Vinyl)"